Click the category of interest to jump to that section of my kits & patterns. All patterns available on red dot tracer only, while my supply lasts. This is such a simple old rug pattern, but it is one of my favorites! Heart in each corner, simple penny flowers, and a blue bird flying above it all (I omitted the bird, but he will be on your pattern to hook or not.) Hooks up fast and really adds instant age to any room! This adaptation was based on the antique hearts rug that I used as my business logo for many years (even before I started hooking.) It really doesn't get much more primitive than this one! I love the simplicity of this rug! It hooks up quickly and would lend itself to many color combinations very well. Great beginner's rug, too. Also see the companion punch needle pattern. My adaptation of an antique penny rug, featured in Create & Decorate Holiday 2009 issue. She was an amazing pattern designer. 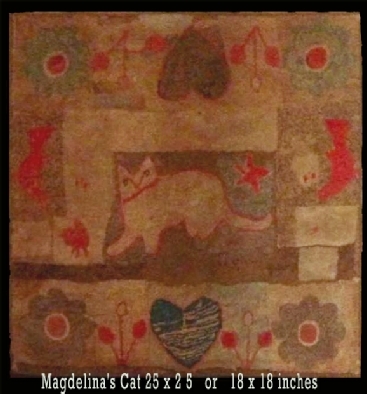 Magdelena Briner’s rugs have inspired us all to hook with a bandon and just let the rug create itself.